Montclair Emergency Services for the Homeless, (MESH) is a local not for profit organization in Montclair, New Jersey. Its mission since 2005 has been to meet the basic essential needs of its homeless neighbors living on the streets in the Montclair community. 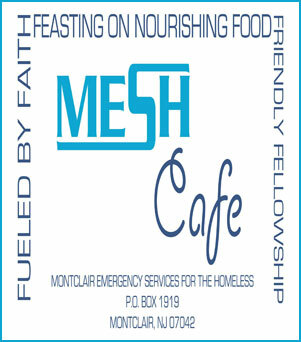 “MESHing” volunteer efforts feature willing workers--adults, children and families--serving in the MESH Café six days a week year round in local churches, including St. John's, synagogues and organizations that provide evening meals for more than 7,500 homeless neighbors annually in the Montclair community. To learn more about MESH, click here.